Poetry comes in different ways to different people. To Pablo Neruda, it came from a place he could not figure out. As he wrote in his marvellous description of the process in his poem Poesia, when the miracle occurred to him: “And it was at that age, poetry arrived / In search of me. I don’t know, I don’t know where / It came from, from winter or a river. / I don’t know how or when… ”. Yogesh Maitreya knows where poetry came from, in his case. No confusion or romanticisation colours his experience of catching the ‘fever’, as Neruda calls it later in the above-mentioned poem. Or a pursuit of pleasure. In these eleven short lines, Maitreya establishes the parameters of his poetics clearly and firmly. He lets the reader know where he is coming from – a history of institutionalised injustice that has been perpetrated on his people. In which multitudes were condemned to degrading labour and a life of meagre means and subsistence. A system which thrived upon creating a rigid hierarchy within fellow human beings, some superior and everyone under them thumb. Or caste, in short. In a conversation with this reviewer sometime back, Maitreya said explicitly that in his view, Indian Writing in English amounted to very little in terms of worth as it was mainly written to express concerns that excluded the majority of Indians, or Bahujans. It is something this reviewer is very much in agreement with. This is the reason which makes Maitreya’s book a seminal contribution to Indian Poetry in English, a wasteland of ignorance and conceit. Maitreya cares two hoots about pleasing this incestuous eco-system, and this gives his work a clear edge over his contemporaries. His lived experience of suffering, social, political and economic, and of a marginalised existence, speaks loudly and clearly through his verse and gives it a certain uniqueness – an irony because his experience is the common experience of Indian masses but their voices have either been repressed on ignored in the ivory tower of IWE. 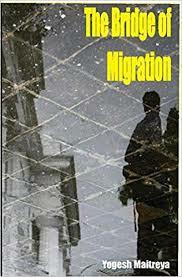 The Bridge of Migration is a slim collection of 76 poems, published by Pather’s Paw, a small press publishing house Maitreya and associates have set up. It has a foreword written by Kuffir Nalgundwar, the inimitable editor of online journal Roundtable India. Maitreya’s debut work is informed by strong socio-political concerns that he expresses without artifice or a belaboured and didactic ‘dedication’ to craft that ruins most of IWE poetry of today. The first few poems of the collection tell us about the beginning of Mitreya’s poetic journey, in which we find the homage to Babasaheb, setting the template. This is followed soon by a striking poem called 1970’s. This was a period of great ferment in the country and society-at-large, although it has not been so rigorously documented so far, in the view of this reviewer. Maitreya surveys it critically and comes up with a gem of a poem that turns upside down our understanding of this turbulent decade. “It all started during this period. / The angry young man rose / Into 70mm’s world. / But like any other thing in this country / His rise was too poisonous. / When today my father recalls / His adolescent days / Into this poisonous venture / That airs on TV, / He doesn’t realise / That it only tells how to be angry at the start, / and all is well at the end.” In this poem, Maitreya interrogates our ‘understanding’ of culture and society by pointing out through the example of his father that the anger of that period was absorbed into nothingness, through mass media which made a spectacle out of it, fit for the big screen through the persona of Mr Amitabh Bachchan. However, nothing changed for India’s poor and disadvantaged. In front of their eyes, even their anger was appropriated by the elites and turned into entertainment. He also explains why he takes this position in his poem Learning to Speak, addressing the galring inequality that informs Indian society, allowing only a select few to access privileged education and then celebrating them as the harbingers of new epistemology, ways of thinking, arts and culture. A rigged game, to be precise. A bluff that Maitreya calls out with great skill. All the poems in this collection are gems, and they need not be polished further. These are not gems that need to adorn the slender necks of pale beauties. These are gems that the poet intends to throw in the fields, and the factories, in universities and other public spaces, hoping for a revolution. These are seeds will lead to a grand harvest one day, one which will be equally distributed. They are sparks in the hay of indifference that characterises India’s atrophied society. These are bombs to make the deaf hear.